Over 200,000 companies have adopted the Teams collaboration tool since it was added to Office 365 last year, Microsoft says. 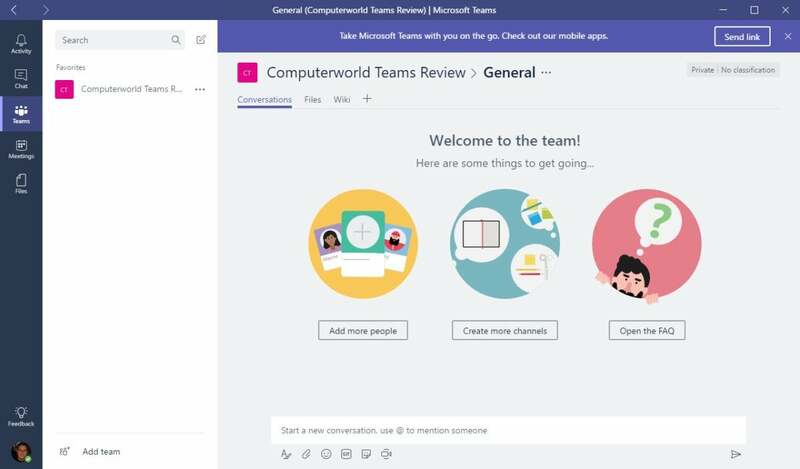 Microsoft Teams celebrated its first year of competing against other collaboration tools like Slack and HipChat by giving users a peek at the roadmap of upcoming features, including cloud recordings, transcription, and even facial recognition. Since Microsoft made Teams part of Office 365 a year ago, the company says more than 200,000 organizations make Teams part of their collaborative tools, including General Motors and Macy's. The blog post listed nine specific additions that it hopes will give Teams an advantage over its more established rivals, though the timeline for their arrival was not revealed. Some will be within Teams itself, and others will be within the devices that connect to it. Within the latter category, Microsoft said that its Surface Hub would be gaining native support for Teams, as well as several partner devices. A summary of what Microsoft Teams has accomplished in its first year, according to Microsoft. Facial recognition: in the "future," Microsoft said, remarks will be attributed to the participants using facial recognition. Inline message translation: Using the automatic translation features in Skype that Microsoft has shown off previously, meeting participants will be able to have their remarks automatically transcribed and translated. Background blurring: Do you work in a home office and hope to avoid this adorable BBC blunder? Teams will automatically blur the background, Microsoft said. Mobile sharing: If you're attending a meeting while stuck in a taxi, you'll be able to see and share a live video from your mobile device. Cortana integration: Not surprisingly, Cortana will be integrated. The benefit here will be that Cortana will set things up for you, rather than forcing you to handle the configuration and scheduling. Proximity detection: If a Skype room service is nearby, you'll be able to add it. Deep hardware support: A lengthy list of room systems (the Logitech SmartDock, Crestron SR, and Polycom MSR, among others) will support Teams natively, along with room phones (the Crestron Mercury, Polycom Trio and Yealink CP960) and personal devices (AudioCodes C450HD). Direct routing: An enterprise-grade calling feature called Direct Routing will turn Teams into a full voice service. What this means for you: We really preferred the simplicity of Slack over Teams in our look at the system last year. But Slack is clearly a text-based communication tool first, with video calls added later. Microsoft, who has owned Skype for years, clearly is taking the opposite approach. Automatic transcription will remove a real source of pain from online meetings, so this is clearly a step forward for Teams.